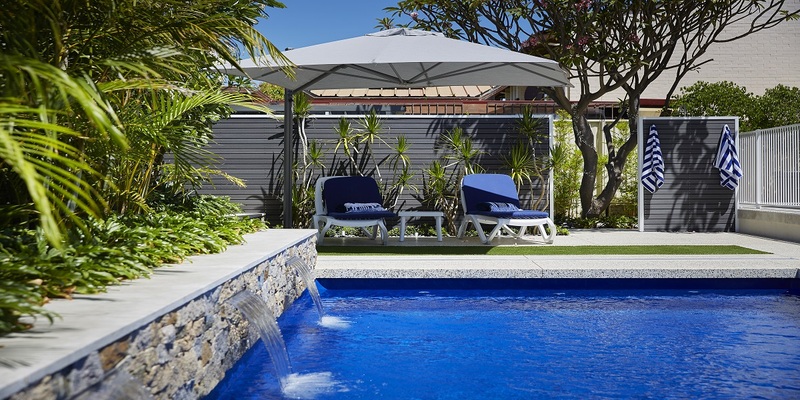 It wasn’t a typical pool installation that greeted the designers from Mondo Landscaping and the builders from eScape Landscape Architecture when they arrived at this Rossmoyne family home. Instead of a bare backyard, what greeted them was a full-sized tennis court that was to become a pool area incorporating a pavilion. Mondo Landscapes Landscape Designer Debbie Taylor said the space presented a range of challenges and considerations. “Mondo Landscapes considered every aspect; coordinating textures and materials, introducing easy transition between indoors and out, balancing design, functionality, viability and growth together with a long-term vision of how the space will mature,” she said. Barrier Reef Pools supplied and installed an 8.5m by 4.4m Majestic pool in Ocean Shimmer and honed aggregate was poured within the pool area and formed over the edge of the pool. A 15m raised garden bed clad in natural stone and capped with Eco Outdoor Garonne limestone was built and incorporated with the pool, along with three water blades. To screen off an existing shed, pool equipment and an outdoor shower with a beautiful dark grey timber screen was built at the south end of the pool with towel hooks for convenience. Also at the south end, a small patch of artificial lawn plus a large umbrella and two sun loungers were incorporated into the design. At the north end of the pool, a pavilion was created to reflect the Hamptons style. “The pool pavilion provides a shady location within the pool area and together with a combination of natural stone and lush tropical plantings brings home the timeless elegance of the Hamptons,” Ms Taylor said. The two golden canes were reused in the raised garden bed within the pool area along with additional palms, and the mature plumeria was planted at the south end of the pool. The existing patio was painted white and extended before being paved with Eco Outdoor Garonne limestone to create the ultimate entertainer’s space.